Background: Cancer has been considered as a deadly disease and its appropriate management is still a global challenge. The traditional anticancer therapeutics have been able to combat the disease to some extent but with numerous adverse effects which affect the quality of life of patients. Method: The introduction of alternative medicines, especially herbal medicines, has attracted the scientists’ due to low toxicity and high efficacy associated with them. However, their poor solubility and bioavailability decrease their efficacy. This has led to the increased use of targeted drug delivery systems in phyto-cancer therapy. Results: Nanoparticles (NPs), a novel drug delivery system has been widely used in the recent years due to their various advantages such as drug targeting, improved solubility, and bioavailability, high efficacy, low toxicity towards normal cells, low drug resistance, high drug loading at tumor site, etc. Conclusion: These benefits have also been observed in studies evaluating phytonanotherapy in cancer. The present review highlights current trends followed by phyto-cancer therapy using NPs. The recent studies conducted on herbal NPs for cancer therapy have also been enlisted. 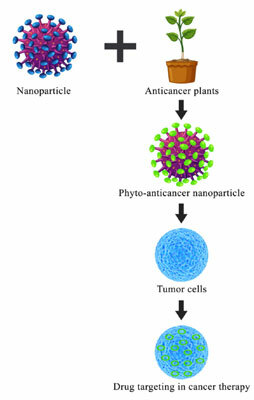 Phyto-cancer therapy, phytonanotherapy, nanoparticles, targeted cancer therapy, novel drug delivery system, anticancer.